Hey guys! So sorry I haven’t really written anything on the blog. I just haven’t really been feeling like writing and then I’m always too lazy to turn on my desktop and ask my clothes to let me borrow my chair. I know. I’m a mess BUT I just finished Daiya no Ace and I’m just so excited and I want to tell you all about it! But what is this show even about? Well, it’s about Sawamura Eijun, a junior high student who is going to be graduating in a couple months. During one of his games, he catches the eye of a scout from Seidou, a really prestigious and well known high school for baseball. 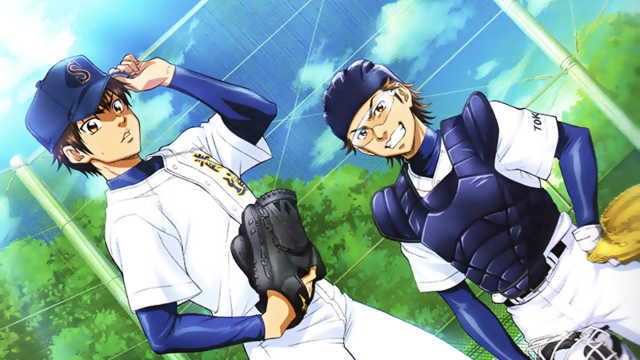 Initially, Sawamura is reluctant to go to Seidou because he already had plans to go to the same school as his friends and continue playing baseball with them, but after checking out Seidou and having Miyuki catch for him, Sawamura falls in love. He wants to go there, to have Miyuki as his catcher as Sawamura is known for his unique pitching style, to get better at playing, and overall, to play baseball at a professional level (since his friends were casuals). And like everyone who goes there, he wants to become Seidou’s Ace! Unfortunately (or fortunately? ), life at Seidou is anything but easy. Because Seidou is a powerhouse there are dozens, if not hundreds, of students vying for the first string (main players) and the Ace position. Students that have more experience (upperclassmen) and students that are just more talented (Furuya and Haruichi), so Sawamura has his work cut out for him. The good thing is that Sawamura is not a quitter and (in my opinion) he sometimes works even harder than many of our other characters. Of course, I could just be biased since I love him so much! As a rival, I think he’s a pretty good match for Sawamura because he’s just naturally good and he’s wanted the Ace position from the beginning. But I won’t talk too much about him because I swear this show really makes me growl at him! I just want to see Sawamura succeed but having this guy always be better somehow in someway fires me up! And since I’m already comparing Daiya to Haikyuu I’m going to continue using it. In Haikyuu I think the show does a great job at really making you love all the characters! Even those in the opposing team. I mean, who wasn’t biting their nails because they didn’t know if they should cheer for Karasuno or Aobajosai? To be honest, when I started Daiya I had a hard time remembering the names and associating faces, but once you get them down, you really start to feel for all the characters. And I just love their interactions! I loved Raichi too. I adored how meek he is off the field. My first thought: “She’s only fangirling a bit?! Is something wrong? !’ XD We all know how much you love Daiya. It’s interesting seeing these older posts of yours, I agree with them. That’s what I love about Daiya, it feels real and it’s very vested in being realistic (aside from Furuya, his speed and power).